China’s growing presence in the South China Sea is raising doubts about the U.S. policy there. China continues to militarize the South China Sea, with the manifest intention of making its claim of sovereignty thereto impossible to challenge. China has made clear that it does not plan to accept a likely unfavorable decision, forthcoming in a month or so, by the Permanent Court of Arbitration in The Hague. Moreover, China has so far refused to discuss any sort of multilateral negotiations over the many overlapping, conflicting territorial claims. Nations who contest China’s claims as violations of their own sovereignty are left having to figure out how to confront China’s increasingly threatening military posture in the South China Sea. Must the Philippines, Vietnam, and other contestants either accede to Chinese sovereignty over the Sea or fight to defend their interests? If, indeed, those are the only options, then the choice seems clear. None of the contesting countries can overcome China’s military might, and they must eventually concede the South China Sea to China and hope for the best. Rather steadily, however, Vietnam and the Philippines have moved beyond that simple choice to another option of greater global significance: strengthening military ties with the United States. By drawing closer to the U.S., China’s Southeast Asian adversaries seek to acquire some degree of balance in the region, so as to dissuade China from brazen invocations of military might to enforce its sweeping claims. Which is to say, they hope a more visible, active American military presence will deter China. There is no doubt that the United States has, for the time being, adequate military resources to more than balance anything China can put into the South China Sea. But, as aficionados of the Cold War will recall, a fundamental component of deterrence is credibility. It is one thing to possess assets, it is another to convince an adversary of your willingness to use them, and another still to convince friends of your willingness to use them on their behalf. A further step requires that your friend believes that your adversary is intimidated by your posture. It is this last element that seems to be at play in the South China Sea. The United States seeks to assure the Philippines and Vietnam, perhaps others, that China will be sufficiently intimidated by growing U.S. involvement to move toward more reasonable, more accommodating policies, and accept the need to resolve the conflict through serious multilateral negotiation. There is little to indicate that the approach is working. The steady course of events in the South China Sea – China’s construction of artificial islands, introduction of surface-to-air missiles, landing strips, fighter jets, advanced radar, encouragement of provocative intrusions by fishing fleets and oil rigs – indicates China’s emerging confidence that major gains in the establishment of virtual sovereignty within its nine-dash line can be had by patiently undertaking a series of many very small steps. China flaunts its belief that no such steps will be obstructed or interfered with by the U.S. It is hard to imagine that one more dock or airstrip or even one more SAM battery would elicit a military confrontation by the U.S. Nor is it likely that China will unambiguously attack an American ship or plane, or commit any clear act of war against the U.S. China, then, can just keep on piling sand. A more pertinent issue with respect to credibility, is how the U.S. would react to a military engagement between China and an aggrieved Southeast Asian nation. Under a Mutual Defense Treaty, made sixty-five years ago and ceremonially reaffirmed in 2011, the United States has some responsibility to side with the Philippines in the event of a Chinese attack. The extent of that responsibility, however, is not spelled out beyond acting “to meet the common danger in accordance with its constitutional processes” and referring the matter to the U.N Security Council. Moreover, it is not at all clear – indeed, it is doubtful – that the treaty requires the United States to resist Chinese encroachments on contested reefs and shoals. Toward Vietnam, the U.S. has no formal obligations at all. The U.S., in short, has plenty of latitude in deciding how to respond to actual military conflict between China and either or both of its most prominent adversaries in the South China Sea. As China continues to strengthen its military capabilities in the maritime region, it appears increasingly confident that the U.S. will not present any physical obstacle to its ambitions. Chinese media emphasize the theme of supposed U.S. weakness, derisively portraying the recent Russian fly-by of an American guided-missile destroyer in the Baltic Sea, for example, as a humiliation. 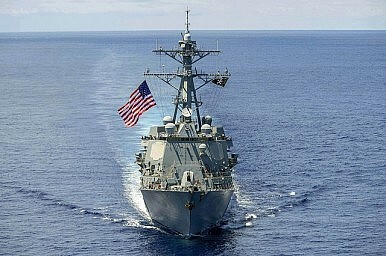 American activities in the South China Sea have not been conducted so as to support Philippine or Vietnamese territorial claims, but to assert a generalized principle of freedom of the seas. Any action to assert or defend their territorial claims will be left, evidently, to the claimants themselves. Any such action taken by a claimant alone would surely be repulsed by China, easily and quickly. Therefore, no such action is likely to occur without concrete prior assurance of American military support. There is no reason to assume that such assurance would ever be forthcoming. If they are paying attention to domestic politics in the United States, China and the rival South China Sea claimants must be aware of how problematic it would be for an American administration to rouse public support for a military confrontation with China over obscure bits of rock and sand in a corner of the world that, to most Americans, is quite remote. At present, polls showing what Americans are concerned about do not even mention the South China Sea conflict. Occasional polls register only some low-to-mid-range concern about “China,” mostly about trade. Importantly, no effort is being made by the present administration to prepare the public for trouble in the South China Sea, nor is there any indication that any successor to this administration will do so. The Paracels and Spratleys are not even a vague shadow of Quemoy and Matsu in the realm of U.S. presidential politics. The persistent increase in China’s intimidating presence in the South China Sea has the effect, intended or not, of raising doubts about America’s course there. The appearance grows that the U.S. may, for a while, offer encouragement to its allies, actual and would-be, but can do little or nothing to actually prevent China’s military dominance of the maritime region. Such is likely to continue to be the case, especially if China exercises self-discipline and patience, moving small step by small step, refraining from ugly provocations or attempts to humiliate the U.S.